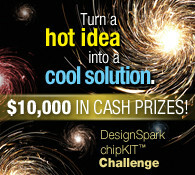 Elektor and Circuit Cellar, in participation with DesignSpark, are pleased to present the winners of the DesignSpark chipKIT Challenge! Engineers from around the globe submitted their eco-friendly and energy efficient designs which were built around a Digilent chipKIT Max32 microcontroller board. Congratulations to Dean Boman, whose Energy Monitoring System earned him First Prize honors and $5,000! Providing real-time home electrical usage data, this chipKIT-based system helps occupants make informed consumption-related decisions. A special thanks goes out to all who participated and congratulations to the rest of the winners! Check out all the winning projects from this competition.